Head and neck injuries are relatively rare in rugby but, because of their potential severity, anything you can do to reduce your chances is time well spent. Include neck exercises in your workouts and protect your head at all times. If you’re going to break your collarbone playing rugby, you might as well break it twice! Here’s how Jade McGrath suffered through a twice broken collarbone and still fronted up for classes on Monday #studentathlete. What happens when you get kicked in the eye playing rugby? For Bobbie Kolarik, it was temporary blindness as a result of optic nerve impact. Read the story here. As soon as one of the opponents ran forward with the ball, I tackled her and remained on the ground after my knee had popped in 3 different places. A week later, after a series of MRI’s and X-Ray’s, I find out I completely tore my ACL and partially tore my Medial Meniscus along with some significant bone bruising and a strain to my MCL, the good news was I didn’t break any bones. I went to an urgent care and before the physician assistant could even say anything, I knew it was broken from the look of the Xray. Turns out I fractured my thumb, but fortunately it was minimally displaced. Have you heard of flesh eating bacteria getting at you while playing rugby? It happens! And this is the story of how it happened to TH Prop Cameron Hayward. The runner got lower than me and hammered me in the chest (shortly before he scored the try). Soon after that hit, I noticed my voice was messed up. 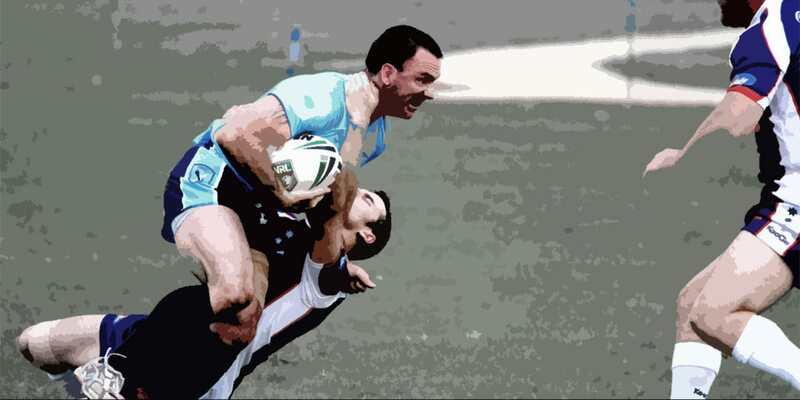 This is the story of how James Elliot lost his cheek bone within his own face during a game of rugby. It’s known as a fractured zygoma, and here’s how it happened. After a two year mission, Bryce Latimer tried to make a quick return to the rugby field only to suffer through a string of injuries that took forever to get through. Just one of those periods. His elbow met my skull just above the eyebrow and then skipped down into the eye orbital itself. I blacked out and when I came too, every one of my teammates was standing over me with a disgusted look on their face. This isn’t a story of the worst injury as much as a weird year I had. In my 6 years of playing, these are all the bloody noses I’ve ever gotten…all on the same field. Here’s the story of James Rosato’s Tibia/Fibula Compound fracture playing rugby – one of the worst broken legs we’ve seen in quite a while! This is the story of Catherine King’s shattered foot – “Overnight I was given a bionic foot with multiple metal plates, pins, and bone grafts. The works. My separated shoulder healed, and still pops and has some major pain when bench pressing, but it’s “just as likely to break now as it was before it broke”, in the words of my doctor. I thought I broke my nose at first, all I could see was blood and I couldn’t feel anything. I sat there with blood everywhere, and had to go to the trainer. A week later, we get it x-rayed again, and They still can’t see anything because of my ribs. So they clear me, and I’m back tackling a week after having my collarbone broken. Jen Marks tells the story of a brutal hip check – I fell to the ground like a sack of potatoes (this was what someone told me later) and I proceeded to have a seizure on the field. I heard the sickening snap and suddenly I was transported into a Quentin Tarantino film, and I briefly wondered if my jugular had been severed. How Samantha Reeves broke her leg in 5 places during a game of rugby 7s. The X-Rays are crazy. But don’t worry, she makes a full (11 month) recovery. This is the story of how Monica Christian suffered a herniation of the C4/C5 discs in her back, was told she’d never run again, and STILL made a full return to the rugby field. If you tore your scrotum playing rugby, do you think you’d finish the game? Better question; do you think you’d score two tries in the game? Justin did. Touch, it was in a warm-up game of touch that granted me my worst rugby injury by far. We were gearing up for our then rival San Antonio and had finally managed to get enough numbers out. Jessica Díaz tells the story of how she tore her ACL and sprained her MCL in the same rugby injury playing for the San José Seahawks women’s team. 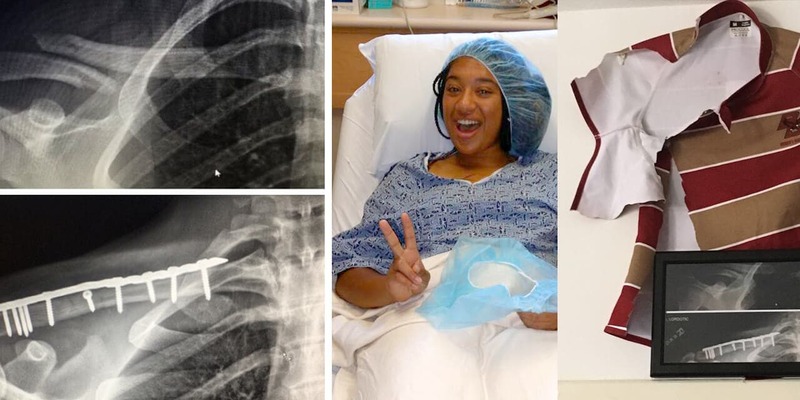 Jessica Isaacs’ initial diagnosis didn’t reveal her fractured left scapula but after a few weeks of intense pain they finally caught it on the MRI! What’s worse than concussion? How about an elbow in the neck, a torn larynx and blood leaking into your trachea? Read Johnny Francis’ worst rugby injury. This is the story of how Gina Rice suffered a neck hyperflexion injury in a game of rugby and then underwent significant surgery and recovery to get back on the rugby field. I was about to tackle the girl, and during the backswing of her stride her fist perfectly connected with my nose. She was trying to “stiff arm”. I made the tackle, but my nose started bleeding and I knew it had broken so I had it checked out at the medic tent. Bryan Hayes’ broken left wrist was a tough injury to recover from – but the University of Cincinnati Scrumhalf made it back to the rugby field. Austin Huns 7s coach Jacob Liberman tells the story of his sheared transverse process and broken spine – by far the scariest and according to him, the worst rugby injury he ever had. If you MUST train for rugby despite being injured, these strategies may allow you to exercise without making your existing problems worse. How hard is it to return to the rugby field after suffering a broken leg? Clarke Cayton explains the road back after sustaining his broken leg. It’s not an easy road, lots of rehab rest and support from his family. Read the story of his road back from a broken leg. “There is no one to blame for my ACL injury but myself.” Nick McCashin explains what its like to get back on the rugby field after a torn ACL. The blog includes a complete breakdown of what it takes to recover from a torn ACL on the rugby field. Pt 2 in our series on what its like to break your leg playing rugby. Today, Clarke Cayton explains the immobilization phase of rugby leg injuries. You might imagine that it’s a lot of laying down and not much else. But you’d be wrong! How should rugby players use stretching to reduce DOMS and improve recovery? Here is a rundown of the best recovery stretches that any rugby player can do. Forget just focusing on strength training, flexibility and mobility both matter. Here’s how to improve them both. A traumatic leg injury can be a devastating experience to the amateur rugby player. When the incident occurs, the whole world instantly comes crashing down. The traumatic phase of a rugby injury usually occurs on the field so acting quickly is critical. 10% of every order is donated to the rugby club of your choice!